The Asia-Pacific Model European Union is a 2-day academic event which aims to enhance students’ knowledge about the European Union, its decision-making processes and its role in different global issues. 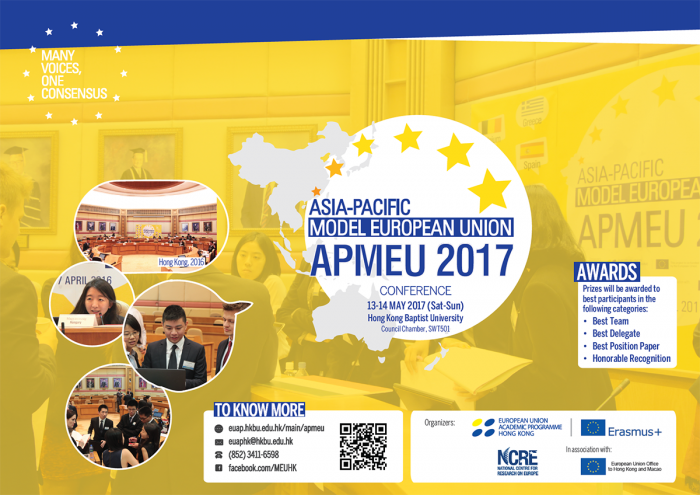 The fourth edition of Asia Pacific Model European Union (APMEU) will be held on 26-27 April at the Hong Kong Baptist University (HKBU). Stay tuned with us for more information and photo later! 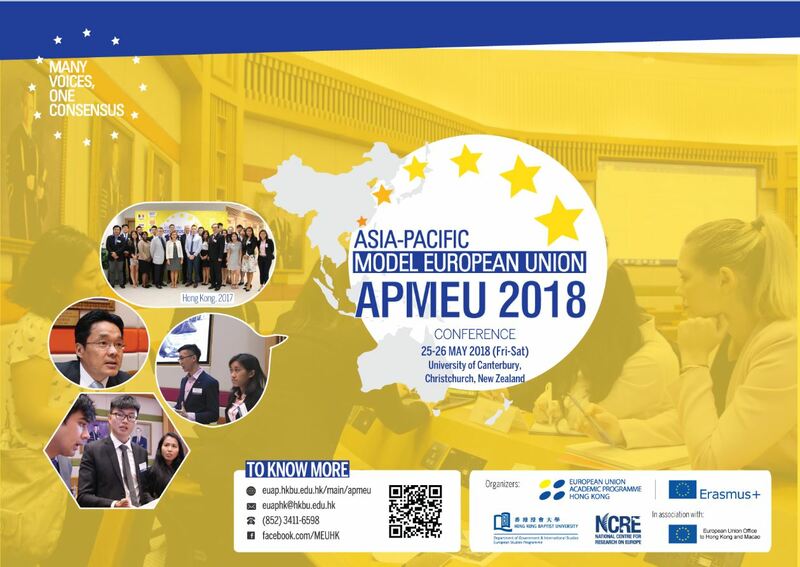 The fourth edition of Asia Pacific Model European Union (APMEU) will be held on 25-26 May at the University of Canterbury, Christchurch, New Zealand . 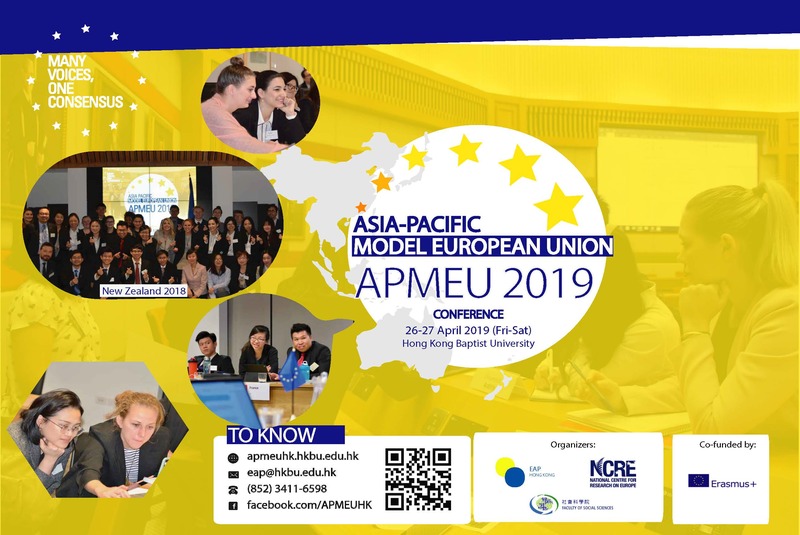 The third edition of Asia Pacific Model European Union (APMEU) was successfully held on 13-14 May at the Hong Kong Baptist University (HKBU). This year, 18 participants from 7 different universities in the region joined us for the simulation. As a Jean Monnet Project funded by the European Commission, APMEU is jointly organized by European Union Academic Programme Hong Kong of HKBU and National Centre for Research on Europe of University of Canterbury, in association with European Union in Hong Kong and Macao. Mr. Alexander Graf Lambsdorff, Vice President of the European Parliament, welcomed the participants in a video-taped remark. He stressed the challenges the EU is facing amid the 60th anniversary of Treaty of Rome, a founding treaty of the European Communities. He also sent his special regards to participants from Hong Kong. In the conference, roles of 9 EU member states were played, including Belgium, Germany, France, Italy, Hungary, Malta, Austria, Sweden, and Greece. The topic for this year’s simulation is the Future of the Europe, based on the ideas put forward in The White Paper 2017: The Future of Europe. The simulation shed lights on migration policy and counter-terrorism. The majority of the states prioritized the refugee crisis in Europe and put migration issue in their top agenda. The intensity of conversation then escalated after the announcement of a scenario that the assault on the French president-elect Emmanuel Macron. The Heads of States and foreign ministers contributed to the dialogue in order to seek to enhance the scrutiny and monitoring measures on cyber security within the existing digital single market strategy. Our participants managed to swiftly react to the news with their abundant knowledge in the mechanism of the EU, and eventually reach a consensus. 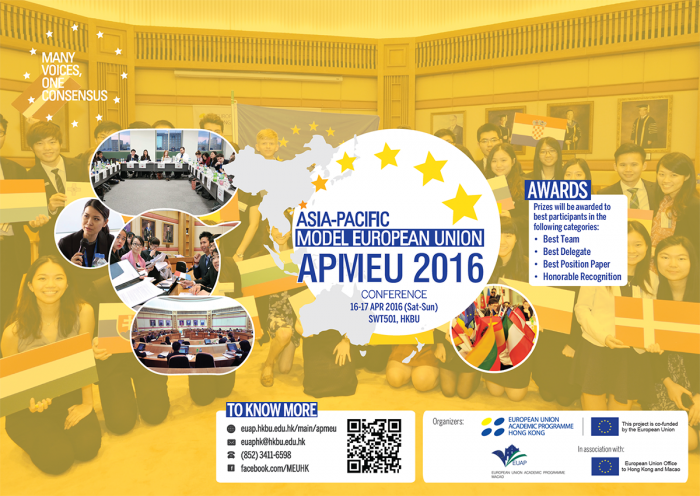 In 2016, the APMEU was held successfully on 16-17 April in Hong Kong at the Hong Kong Baptist University. 24 participants coming from different Universities in the region gathered right here in HKBU for the APMEU conference simulation. They represented 12 EU member states respectively to discuss the European migrant crisis. It is jointly organized by European Union Academic Programme Hong Kong and European Union Academic Programme Macao, in association with European Union in Hong Kong and Macao.